The Russian website is back. Using Google translation, here's one excerpt that's been translated from Russian to English. "Fulham - London area, which is located along the north bank of the Thames between Chelsea neighborhood (west) and Hammersmith (to the east). Fulham affects its tidiness and cleanliness and, of course, for its many parks and gardens. Known Bishop's Park, the gardens of the palace and park Fulhemskogo Parsons Green on the weekend are a great spot for young couples in London the capital. Fulham - a wonderful area for an active evening with a variety of bars, pubs and restaurants". Good news: the link is working again. For anyone wondering what this means - "Апартаменты в новом жилом комплексе, с великолепным видом на Темзу, в районе Фулхэм (Лондон). 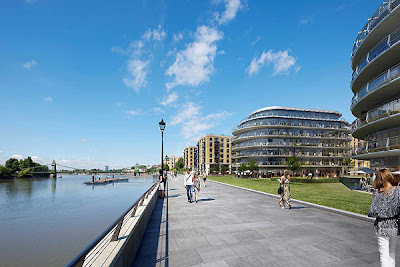 Великобритания" - Google Translate says, "Apartments in new residential complex, with magnificent views of the River Thames, near Fulham (London). United Kingdom"
More... An FT piece on 3 Aug says that overseas buyers are also pushing up the price of mid-priced property, with nearly three-quarter of new homes in central London – including studios and one-bed flats – being bought by foreign purchasers. This means that local people on a reasonable income are going to find it ever harder to buy in Hammersmith & Fulham.